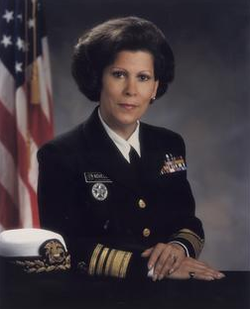 Dr. Antonia Coello Novello, the first woman and Hispanic U.S. surgeon general, has been a champion for women, children and minorities, and others who need a voice. Her journey from a difficult childhood in Fajardo, Puerto Rico, to the rank of America’s chief health educator is an inspiration for the next generation of Latina scientists. Driven by a desire to help others overcome health problems, Dr. Novello earned a B.S. degree at Rio Piedras in 1965 and an M.D. degree from the University of Puerto Rico in 1970. In 1982, she earned her M.P.H. degree from the John Hopkins School of Hygiene and Public Health. Dr. Novello joined the Public Health Service Commissioned Corps in 1978, where she was assigned to be a project officer at the National Institute of Arthritis, Metabolism and Digestive Diseases of the National Institutes of Health (NIH). In 1990, Dr. Novello was appointed surgeon general of the United States serving until 1993. During her tenure, she brought national attention to women's health, breast cancer, children’s health and neonatal transmission of HIV. She focused on improving health care for minorities, raising awareness about environmental health hazards, exposing domestic violence, and finding ways to diminish the stigma of mental illness. She was outspoken about underage drinking and illegal tobacco use, and often criticized the alcohol and tobacco industries for their marketing tactics targeting youth. After completing her service as surgeon general, Dr. Novello worked with UNICEF before becoming commissioner of health for the state of New York from 1999 until 2007. Her calm strength in the face of crisis provided leadership during the 9/11 terrorist attacks, the anthrax contamination, and the SARS epidemic. Throughout her distinguished career, Dr. Novello has lived by the principle, "Service is the rent you pay for living, and that service is what sets you apart."